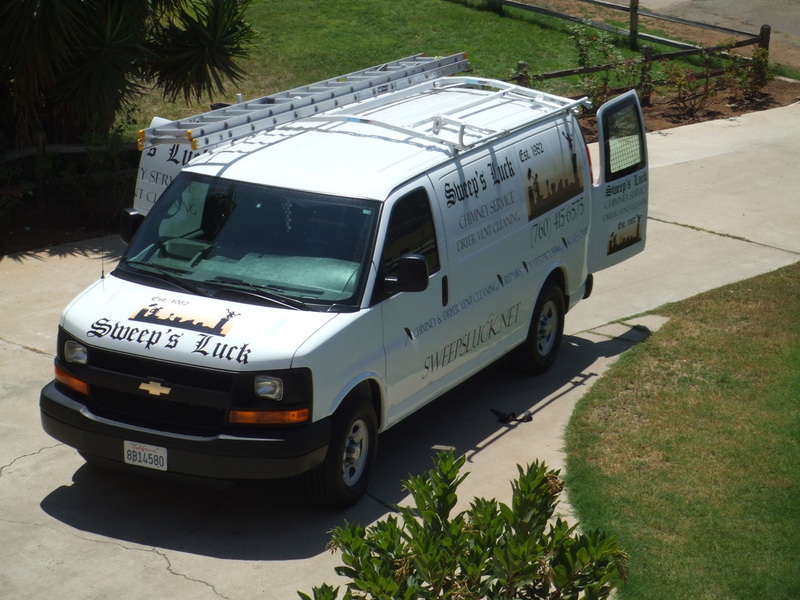 Chimney Sweep Services - Sweep&apos;s Luck - Chimney, Dryer Vent and Air Duct Cleaning company serving San Diego and Lake Arrowhead. We have grown to cover most of Southern California, including Big Bear Lake, Lake Arrowhead, Temecula, San Diego County and all surrounding areas. Give us a call and we can put our 30 years of experience to work for you. Do you have smoke in the house when you have a fire in the fireplace? Do you wish your fireplace would put out more heat? Do you have an odd smell coming from your fireplace? Just having your fireplace cleaned can solve many fireplace related problems. Our chimney sweep services can help you. Also, if your fire just doesn’t perform well, you could have a problem in your chimney. It is important that your fireplace is inspected yearly and cleaned if necessary. By having a professional chimney sweep inspect and clean your chimney, you can prevent buildup, smoke in the house and even the danger of a home fire. Many people wonder how much it costs to have a chimney sweep clean their chimney. Most people don’t know who to contact to clean or repair their chimney. Call Sweep’s Luck Chimney Sweep office, we are more than happy to answer any questions you may have regarding your fireplace. We do more than just repair and clean chimneys, we also offer air duct and dryer vent cleaning. There aren’t many chimney cleaning companies around. Sweep’s Luck has been helping families for 30 years. Give us a call today so we can help you. The Fire Department says you should have your chimney cleaned when you have a quarter-inch of creosote build up. Most chimneys have much more than that.